"For the first time, music lovers who were previously content with passively listening to their favorite songs can now play the music of their lives," said Dane Madsen, marketing manager for digital pianos at Yamaha. Imagine the thrill of playing piano with your favorite artists—Billy Joel, Sting, John Lennon, Elton John, anyone—even if you have never touched the keys before. Now it’s possible, with the new Yamaha Clavinova CSP-150 and CSP-170 digital pianos, the world’s first instruments that can scan audio songs in the user’s music library on a smart tablet, analyze the chord structure and produce a piano score taught via interactive “Stream Lights” above each key. Clavinova CSP series represents an entirely new product category from the digital piano market leader and world’s largest manufacturer of musical instruments. The new series perfectly complements the company’s award-winning Clavinova CLP and CVP series digital pianos, which have delighted piano players for decades, and is designed for anyone who’s passionate about music, and wants to pursue this passion further. These new instruments effectively “gamify” the piano experience, using game-like elements to inspire users to instantly play their favorite songs with original artist recordings and perform increasingly complex arrangements, all without any fear of failure or boring practice. 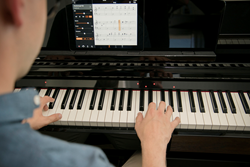 With the heart of a CVP and the svelte, stylish body of a CLP, the CSP is the first Clavinova where most of the features are accessed through a tablet device, using an exclusive app called Smart Pianist. At the center of this remarkable innovation is the app’s unique Audio-to-Score function, which analyzes iTunes music files that already reside on an iPad (Android support coming spring 2018), then generates a piano accompaniment and a chart of chord symbols for those songs. This is displayed on the device placed in front of the user, and tethered to the CSP via direct connectors for both iOS and Android devices hidden behind the music rack. As the selected song plays, Stream Lights — a ladder of four cascading LED lights above each key — illuminate in rhythmic sync with the song’s tempo, beginning with the light farthest from the key. The key should finally be struck as the closest light turns on. This gives the player advance notice of which note to play next — not to mention the engaging fun factor reminiscent of band-simulator video games, such as Rock Band and Guitar Hero. Only with the CSP, the notes the player learns are real, on a high quality digital piano. Perhaps most important is that this new approach to piano learning removes a long-standing obstacle to engagement. With conventional lessons, the student practices music that he or she may or may not like, along with tedious scales, and all with limited feedback. This is daunting and uninspiring to many, and the end result is that students quickly lose interest and abandon the instrument. The CSP, on the other hand, appeals to a new generation of casual players who want to learn the songs they already own and love, using the smart device they already own and love. As they become more and more inspired, confident and proficient, they may even take the experience to the ultimate level — formal lessons from a piano teacher. The complexity of the accompaniment is adjustable via settings that determine how many notes are required in each hand, whether arpeggios or other piano techniques are called for, and more. Once a player is comfortable with accompanying a song at a basic level, he or she can go back and try a more advanced treatment — or as gamers would say, level up. Adding to the enjoyment are 100 popular and classical songs by the likes of Adele, Sting, Elton John and Coldplay built into the app, along with 303 lessons by Beyer, Czerny, Hanon and Burgmüller. At the touch of button on the iPad screen, the user can play both the melody line and accompaniment for these songs and lessons, which are also displayed as Stream Lights on the CSP. The Clavinova CSP line also offers the experience of playing a great sounding acoustic piano — after all, Yamaha has been manufacturing traditional instruments for more than a century. The company has painstakingly sampled two of its finest concert grand pianos — the Yamaha CFX and Bösendorfer Imperial — and has integrated these sounds into the CSP. Expressiveness and realism are further enhanced by Virtual Resonance Modeling (VRM), which meticulously recreates the myriad internal vibrations, as well as key-off samples, which replicate the tone produced when the damper comes to rest on a string in an acoustic piano.